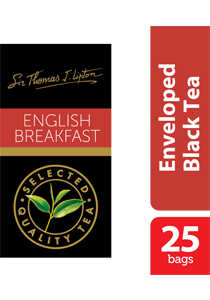 SIR THOMAS LIPTON English Breakfast is a full bodied black tea. It is a popular blend of Kenyan, Ceylon and other choice teas, notable for their bold, robust flavour. SIR THOMAS LIPTON Specialty Tea Collection is a distinctive range of specialty teas made from the finest quality tea and herbal infusions. This distinctive range of SIR THOMAS LIPTON specialty teas are offered to establishments with quality in mind. The finest ingredients are sealed in sachets which maintain quality, freshness and ensure consistency of aroma. Place one tea bag for each person in a cup or pot. Pour in fresh boiling water. Allow to Infuse for 2 -3 minutes. Add milk, sugar or honey as desired.